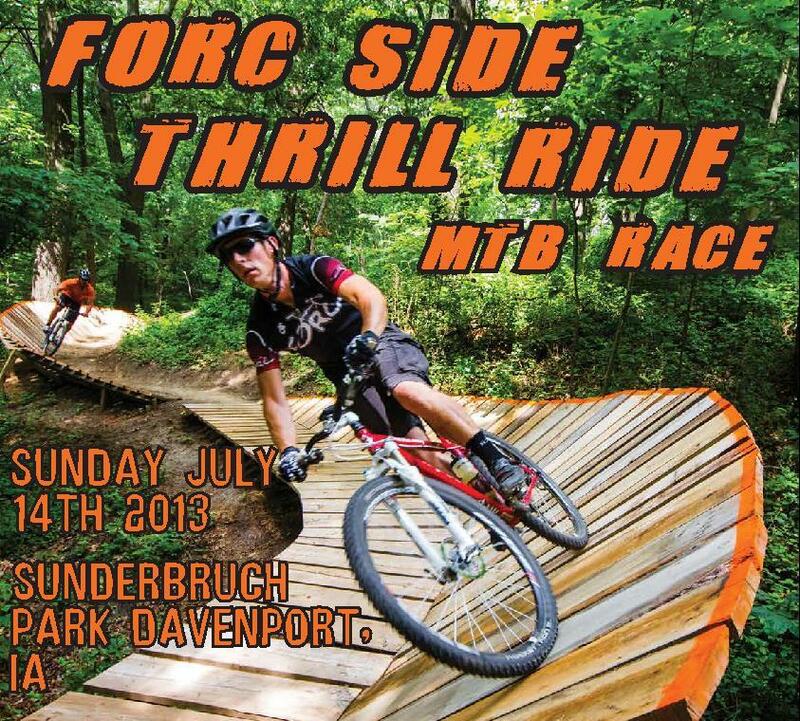 This weekend we headed to Davenport for the Forc Side Thrill Race at Sunderbruch Park. The race was part of both the Iowa & Illinois races series so there was a great turnout. It was also the first time in 5 years that there has been a race held at this course. It was definitely worth the wait! These trails were so much fun. There was some hard climbing, but plenty of fast and flowy, and tight and twisty sections to enjoy. 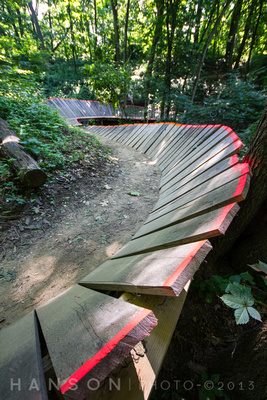 There was also a nice mix of log overs, small jumps, and berms to keep things interesting. And the best part, they had a few water station set up on the course with ice cold water – I’ve been fantasizing about a nice cold drink of water at the last few races where it’s been really hot! A huge thanks to FORC and all of the volunteers for putting on such an awesome race! Luckily the expert/cat 1 race started an hour later than usual, at 1pm. Several of us from Iowa City had a wedding for good friends the night before and the extra time to recuperate was much needed (I don’t usually drink, but boy were those Gin & Tonics good) ;). Bride, Groom, & entire wedding party heading to the reception on bike! ﻿﻿﻿﻿﻿﻿﻿﻿﻿﻿﻿﻿﻿﻿﻿On the first lap we climbed up the paved road to hop in at the 2nd trail. I made it into the single track 2nd, behind Brittany, which was exactly where I wanted to be. My goal for this race was to stick a little closer to her than the last time we raced together, she is fast!! On the first part of the course there was a water crossing followed by a sharp left turn up a fairly steep climb. Then, there was a little downhill section followed by a sharp right turn and a very steep climb. I didn’t take the correct line up of the hill and had to run part of it. There were plenty of spectators cheering us on, especially at the big wooden berm – thank you for the encouragement! The lap ended with a super fun and fast decent (Kickapoo Down trail). By the start of the second lap, I was still in 2nd place, but the girl in 3rd (Beverly) was gaining and right behind me. I would get slightly ahead on the tight and flowy sections, with her catching right up on the climbs. (I really, really, really, need to get betting at climbing!!). On the super steep climb I once again took the wrong line and had to run up, at this point I was passed and now in 3rd place. I also struggled on the following climb and Beverly got a larger gap. I continued to chase for the rest of the lap and the third lap. On the first trail of the last lap (Kickapoo Up), I could see two of the chasing girls finishing up their second lap on Kickapoo down. I knew I needed to keep going strong so I wouldn’t get caught. I finally took the correct line up the steep climb and made it all the way, yay! About half way through the leader of the Men’s Expert race caught up and it was my husband Aaron – way to go! The second and third place men weren’t far behind, so I was really hoping Aaron’s lead would stick. I made it through the rest of the lap mostly without problem, but did get a little friendly with a tree. I managed to not only hit my bars but also a couple fingers –ouch! But I stayed up right and it really wasn’t a big deal. I blasted down Kickapoo Down to the finish in 3rd place. All the ladies were riding super strong and had a good race – nice job!!! Cara, Brittany, Robin, Emily, Aleeza, Scout Dog, & Ingrid. Robin Hayward – DNF Women’s Beginner (She selflessly DNF’d to take care of a youth rider in the beginners race who injured themself!). If you are in the area and haven’t ridden the trails at Sunderbruch, I recommend them. 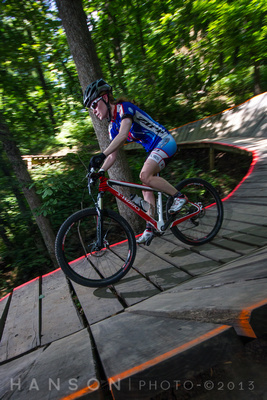 This was one of the more fun race courses/trail system that I have ridden. There is something for everyone, and two very technical trails that they left out of the race. There are some nice obstacles to tackle, but in general, just super fun and fast trails. Photography for the race photos!